A product featured in this post was provided for review by W2Beauty. All opinions and recommendations in this post are my own unless otherwise noted. Learn more about my rules for store partnerships by checking out my sponsorship policy and sponsor list. 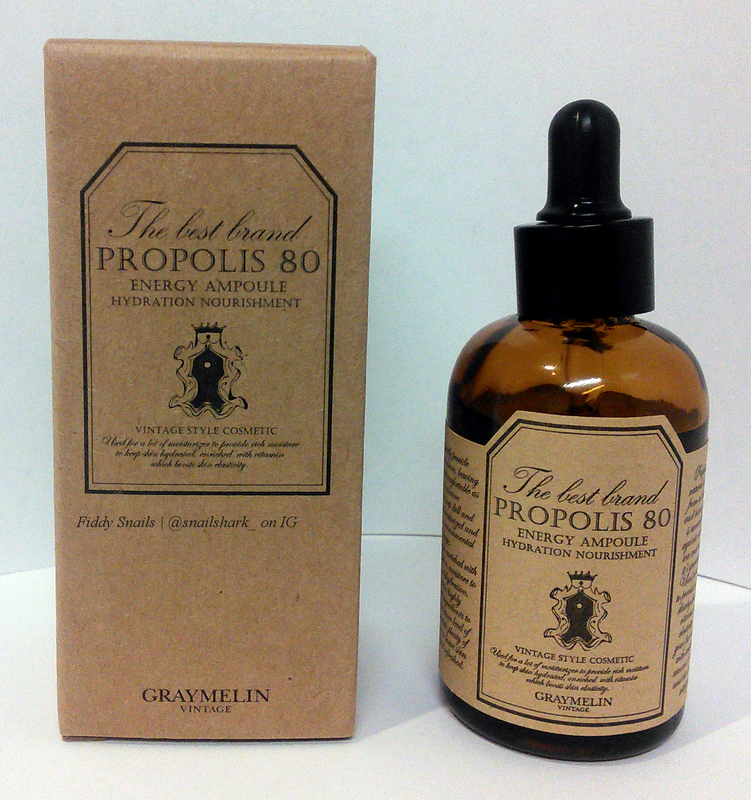 Fiddy editorial note: An earlier version of this review incorrectly stated that Graymelin Propolis 80 Energy Ampoule does not have an adequate preservative system. 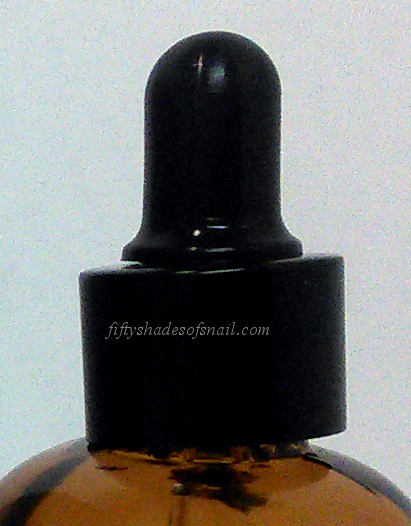 I’ve updated the review and my rating of the ampoule to reflect that it does. My bad, guys. Bees are such amazing little creatures. These fuzzy little guys spend their days buzzing around from flower to flower without a thought in their head except what’s best for their hive, and they make so many things that benefit us big bumbling humans (who so rarely think anything of the makers except to scream and run away when one of them flies too close to our faces). Honey is delicious, of course, and it can even be fermented into a mild alcoholic drink for your next Ren Faire excursion, not to mention how nice it is for the face. Royal jelly is also lovely for skin, and the nutritious substance is commonly sold for consumption as traditional Chinese medicine. Even propolis, the resin that our little honeybee friends make to seal up their hives, is wonderful! That’s why, when I see a propolis ampoule in a K-beauty shop, my first impulse is always to put it in my cart and check out before I can stop myself. Which, in turn, is why I ended up with two different propolis ampoules in my skincare wardrobe. At first glance, the Graymelin Propolis 80 Energy Ampoule and the Tosowoong Propolis Sparkle Ampoule seem so alike that you’d think it doesn’t matter which one you use. As it turns out, that’s not true. Here’s my comparison of these two products and my conclusions about which one is better, and why! Packaging aesthetics are not a factor in my comparison…though you’ll see below that packaging quality is. Purpose: Graymelin Propolis 80 Energy Ampoule and Tosowoong Propolis Sparkle Ampoule are hydrating products formulated to soothe, moisturize, and deliver protective antioxidants to skin. Best suited for: All skin types. Graymelin knows how to make pretty packaging. Also, guess what? I learned how to do auto white balance and color correction today! Yay Fiddy! Do not use if: You are sensitive to propolis or honey, botanical extracts and oils, or anything else in the ingredients lists. Use with caution and definitely for sure 100% patch test if you have, or suspect you have, a bee allergy or sensitivity to bees or bee products. When and how to use: At the serum step of your skincare routine, spread a thin layer of product over your face. Pat in if desired. Continue with the rest of your routine. Tosowoong lists several of its botanical extracts higher up in its ingredients list. This may or may not mean that the Propolis Sparkle Ampoule contains them in greater quantities. On the other hand, Tosowoong Propolis Sparkle Ampoule also contains some citrus oils, and those may or may not cause photosensitivity and even phototoxicity if applied to skin that is then exposed to the sun (it depends on how the oils are processed, which is also impossible to gauge from the product label). For what it’s worth, I’ve used the Propolis Sparkle Ampoule for months without experiencing any UV-related problems. Then again, I also use strong sunscreen every day. As you might assume based on the superficially similar ingredients lists, Graymelin’s and Tosowoong’s propolis ampoules have a lot in common. Both are faintly sweet-smelling, clear, watery medium-consistency gels that sink into my skin quickly and completely and leave it feeling supple and refreshed. The Tosowoong is ever so slightly thicker and the Graymelin ever so slightly more slippery. The differences in performance between the two products are subtle but unmistakable. Like The Acid Queen, I found the Graymelin Propolis 80 Energy Ampoule less hydrating than expected. My digital skin analyzer measurements of this product’s effects showed an average 8% water gain, which isn’t much at all. But the Graymelin product excels at calming irritation and soothing redness, producing even-toned, glowy skin. When my skin’s looking dull and tired, the Propolis 80 Energy Ampoule really does seem to give it energy and make it look more radiant and alive. The Propolis 80 Energy Ampoule also has a packaging problem, however. I love the way the bottle looks, like an old-timey bottle of laudanum, but unfortunately I find that it’s about as touchy to use as old-timey bottles of laudanum probably were. If I don’t screw the cap on just right, it pops open again. It also spontaneously pops open in my skincare basket if jostled. I’m not the only one to have noticed this, either–I’ve had conversations on Snapchat with a couple of other people who’ve experienced the same problem. I’ve reached in for the bottle and come up with only the cap and dropper plenty of times. That is not conducive to contamination prevention. The cap won’t even sit straight on the bottle if it isn’t screwed on exactly perfectly. 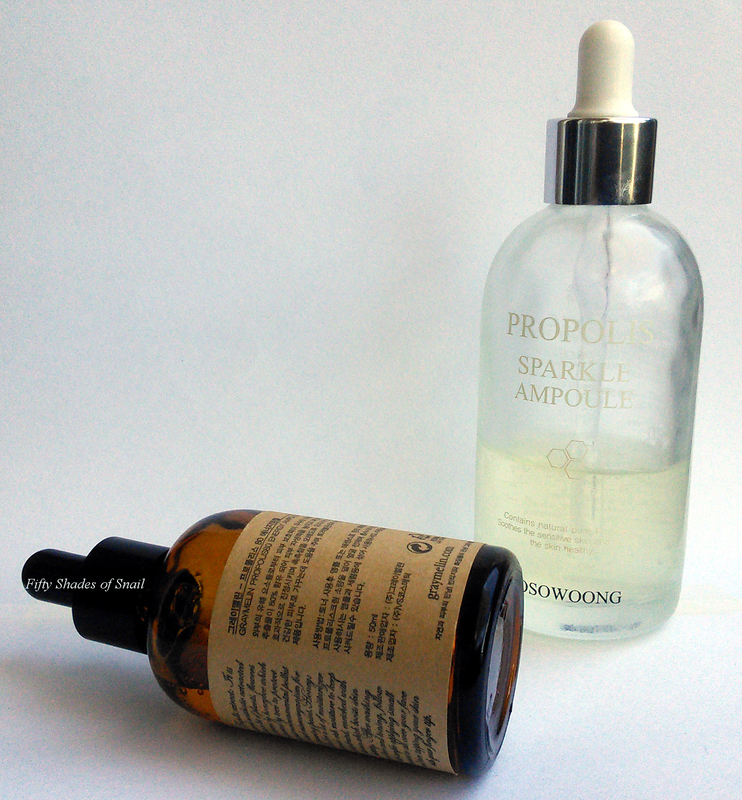 The Tosowoong Propolis Sparkle Ampoule is a hydration powerhouse. Using this product gave me an average 20% increase in skin hydration, which is pretty incredible for this product type. I did find it less effective against redness and inflammation, however, although the Propolis Sparkle Ampoule does also bring my skin that lively glow that propolis products so often do. 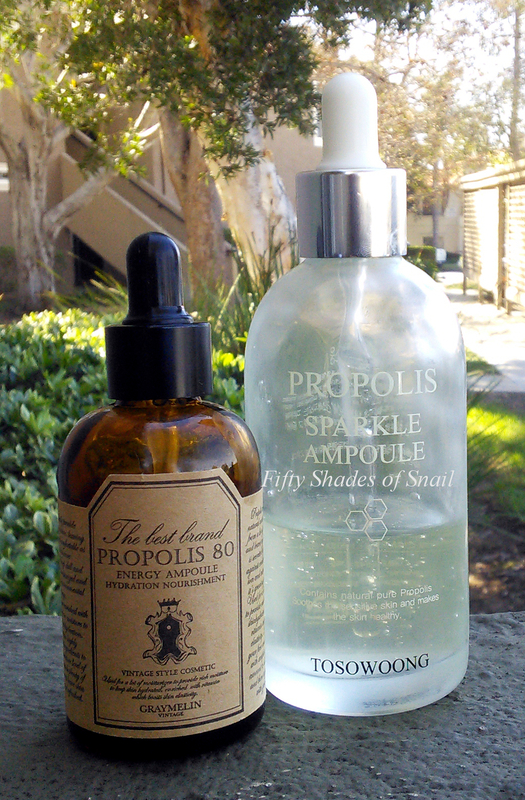 As a final note, the Propolis Sparkle Ampoule comes in a much larger bottle than the Graymelin. As a Heavy Handed Person who likes to mix things like this into multiple skincare products in addition to applying it straight to my face, I appreciate that. The choice here isn’t clear. Is it a TKO? Or will Graymelin rise again? If your skin is oily, easily irritated, or acneic, or if your main concern is calming inflammation or easing redness, the Graymelin Propolis 80 Energy Ampoule will probably suit your needs better. I like it enough that I’m looking into the cream from the same line. If, on the other hand, your skin is dry or dehydrated and you want to address those issues, the Tosowoong Propolis Sparkle Ampoule will most likely work better for you–and you can enjoy the huge gigantic bottle for months! Where can I buy the Graymelin and Tosowoong propolis ampoules? I received my Graymelin Propolis 80 Energy Ampoule from W2Beauty, where one 50ml bottle is $26.99 with free shipping. If you’ve never shopped from W2Beauty before, enter my code, 1323053309, at registration to receive $5 off of your first order over $30. Which propolis ampoule do you prefer? This post contains affiliate links, which generate commissions that support Fifty Shades of Snail and Fiddy’s further skincare adventures. Full disclosures can be found here. Ooh! How does it taste? The LJH is way concentrated compared to these; it does give the moisture and glow, but also brightening effects that these don’t. I mix that one in with other stuff and don’t really like how it feels if I use it on its own. These can be slathered wildly all over! Honey wine was so disappointing and tasted like regular white wine with no honey! We even drank the whole bottle just to make sure! I mix my LJH like you do. But when Renee used it for the first time, she squeezed the whole dropper into her hand and rubbed it all over her face and I almost throttled her for using up like 1 ml out of 15. What is if you have dry skin and your concern is redness? Well I guess I have no choice now. I have to get a sugar daddy! I quite literally held my breath and immediately clicked on the link when this showed up in my e-mail this morning. That’s because I had just ordered the Tosowoong Sparkling Propolis on Friday (from Cupidrop) and did not want to learn 2 days later that I had perhaps made the wrong choice! I’ve never read a review so quickly in all my life (and, of course, with breath still firmly held). Fortunately, I’m back from the blue and breathing normally now, and even read the review a second time (as I always do anyway) to make sure it was all completely patted in and fully absorbed! Whew! Dodged a bullet there! I have been using the LJH Propolis for the past 2 months (again, based on your review) and do have to say it is a magnificent product. I use the HL Lotion as a “carrier” just as you previously suggested, and I must say that this is quite the combination for deep hydration as well as amping up my AB glow (to the extent that anyone as “ancient” as me – as opposed to very young like you – can have an actual AB glow). The LJH is great for travel because it is such a small bottle, and travel is something I find really dulls and dries out my skin. I can report that the LJH is battle-tested in this regard as it was my savior during a recent 2 week+ round-the-world trip. That and copious sheet masks, of course! Speaking of which, the LJH+HL is great prior to sheet masking and – as I discovered to my delight – even greater prior to using one of those new-fangled rubber masks (as suggested by Glow Recipe). These are great for travel, too! You might want to try this some time! Thank you for this most excellent review. I pat in each and every word of each and every review until they are truly and fully absorbed because all of your reviews make for new (and exciting) chapters in my AB Bible. I am very curious about your opinion on the Shara Shara Honey Bomb All-in-One Ampoule? It’s on my wish list and I am quite hyped about it. I really like it! I’m actually on my second jar and reach for it a lot. Very moisturizing and saves me a few steps if I’m in a hurry. Great review! If I hadn’t tried either, based on your review I’d probably go with the Graymelin, which makes me feel like some kind of retroactive genius. I need all the hydration I can get but I also have redness I’d probably get the tosowoong because its cheaper on RoseRoseShop. I’ve never bought from there. Is the shipping very expensive? RRS shipping is…interesting. I’ve never fully figured out the trick to it, tbqh. Dude the trick is maths. So much maths. And haul Tetris. My last RRS haul consisted of me writing down precise weights, comparing limits for each shipping bracket and then Tetrising around my products for like 45 minutes to figure out if it was cheaper to split the giant order into two smaller, lighter ones or just keep it as one giant one. Ah jeez. That made my head hurt just reading it 😦 But I think I may hit you up for advice the next time I want to haul like 50 Etude House sheet masks again! Also totally unrelated, but I snapped you a picture of the Sulwhasoo Concentrated Ginseng Oil sometime this morning…have you SEEN it?! It sounds SO NICE. I impulse bought a pretty travel bottle from eBay along with some samples of their Herblinic ampoule. OH NO. I’m running low on my third bottle of illi Total Aging Care body lotion. Should I try the Innisfree Camellia lotoin? SHOULD I??????? Well. Does the illi lotion smell like the camellia mask and the total aging care oil? If so, I think that smells like after-sun lotion and the Innisfree one smells a bit stronger than that. It’s way less perfumey than their orchid line, but more smelly than the illi intensive moisture mask…it’s more like the classic herbal-floral, Aveda-y scent that I always associate with Innisfree. I would say it’s about as scented as Joseon cream. I know your smeller is more sensitive than mine, but if you can handle Joseon I think you’ll like the scent of this lotion. The Innisfree camellia is GLORIOUSLY buttery and makes a big difference in the desert wasteland of my body skin. It’s some kind of magical body oil-in-lotion wizardry, so a little goes a long way and keeps my skin from being itchy all day. PS – The full name is Innisfree Jeju Camellia Butter Body Lotion. There’s another one that’s in a tub that’s a bit more occlusive, but the pump bottle is way more economical and works just as well IMO. I just bought the tosowoong sparkling ampoule mostly for the reason that the other Graymelin Propolis 80 Energy Ampoule has chamomile and I am very allergic to chamomile . I realised I was body rolling in my seat once I got to the end of your review. Yeah, no shame, I love me some honey propolis. I’ve just finished the Skinfood version, it was lovely at the start but by the end it didn’t really do much. I shall look into these lovelies as replacements! Woohoo! Which one are you thinking about trying? Graymelin, I can get my moisture elsewhere! Ha….I’m tempted by the Cosrx and Pureheals propolis choices now…. I just learned about the PureHeals when the Tosowoong showed up at my door (naturally). With 90% propolis, this product has me intrigued. My thinking is the higher the percentage of propolis, the more the glow – just based on comparing the LJH with the Tososwoong. And, one can never have enough AB glow. I’ll be curious to see your comments about the PureHeal and the CosRx, with comparison to the 2 you’ve reviewed here. hi, how does the Tosowoong Propolis Sparkle Ampoule compare to the Tosowoong Propolis Brightening Essence? which one do you like more n why? have you tried the Scinic Propolis Ampoule 95%?